Thank you to "mytub" for their promptness, efficiency in delivering exactly what was ordered, on time and at a price matched sum from another supplier who was not able to deliver by the required date. "Mytub" did exactly what they said they would do and well done to the staff who helped. An Anexcellent Anexcellentfast Anexcellentfastand Anexcellentfastandprompt Anexcellent fast and prompt service would would ertainly recommend recommendto recommend to all. 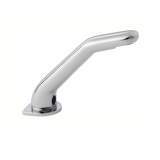 Why choose MyTub Limited for 1/2inch p876 basin tap - hot non-con chrome 360072?